What aspects of my financial life should I be thinking about? Am I financially able to retire? How can I create a solid investment portfolio? How can I find a good financial planner? Posted on February 27, 2013 by Sunit Bhalla. The 2010 Patient Protection and Affordable Care Act and the American Taxpayer Relief Act of 2012 changed the 2013 tax structure. Sunit discussed the 2013 tax structure with his clients, determined how the tax changes impacted their specific situations, and developed a strategy to incorporate the impact of the 2013 tax laws into future financial decisions. A subset of the information discussed with clients is shown in the slides below. Click on the images below to see the slides. Posted on February 25, 2013 by Sunit Bhalla. 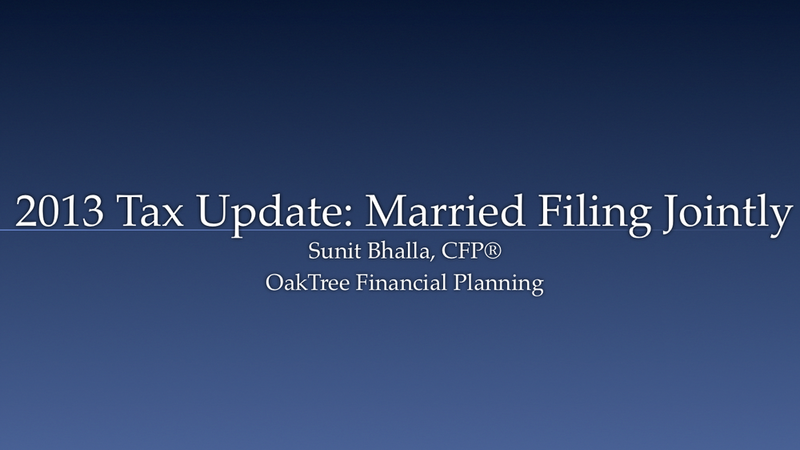 Sunit Bhalla, CFP® is the principal at OakTree Financial Planning, a fee-only firm that specializes in financial planning and portfolio management for engineers and other technology professionals.